The Strikeforce Heavyweight Grand Prix continues on Saturday night with the semifinal round at the U.S. Bank Arena in Cincinnati. The fighters on the card weigh in Friday afternoon at the venue. 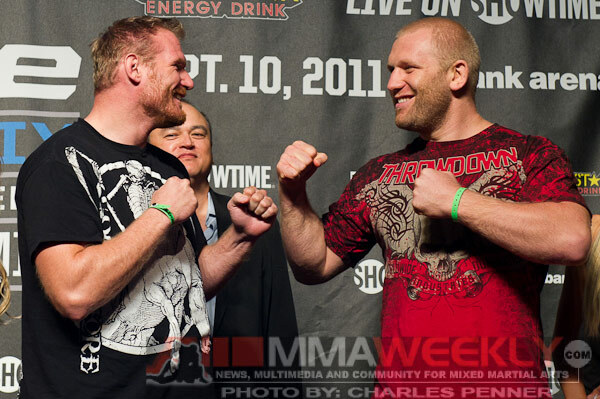 The two semifinal bouts pit Josh Barnett against Sergei Kharitonov and Antonio “Bigfoot” Silva against Daniel Cormier. The fight card also features a middleweight title bout between champion Ronaldo “Jacare” Souza and Luke Rockhold. Barnett, largely considered the favorite in the tournament, stepped on the scale at 261 pounds. Kharitonov – the dark horse in the tournament – weighed in at 256.5 pounds. Silva will be a difficult fighter to dispatch from the tournament, however. At six-foot-four, he tipped the scale at 264.5 pounds, while Cormier is four inches shorter and 17.5 pounds lighter, weighing in at 247 pounds. Jacare and Rockhold easily made weight for their title bout, both fighters hitting the mark dead-on at 185 pounds.